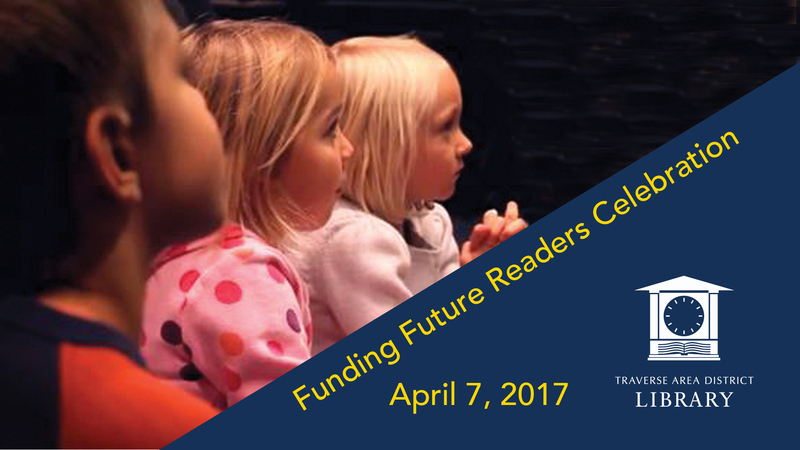 « Main Library Closes at 3:00 p.m.
Library patrons, friends and community members are invited to attend a Funding Future Readers celebration event in the beautiful Traverse Area District Library (TADL). The evening will start at 6:30 p.m. and feature catered hearty hors d’oeuvres and beverages with cash bar, live musical entertainment, a special volunteer recognition, live and silent auctions, and a special preview and fundraising kick-off for a new Preschool Interactive Learning Area at the library. All proceeds from the Live and Silent auctions will support a new Preschool Interactive Learning Area. This area will provide generations of Grand Traverse area children and their families a whimsical hands-on early literacy destination to foster a love of learning and literature. Auction items will include rare and collectible books (with some signed and first editions), an array of children’s literature figurines, fine artwork and many once-in-a-library donor opportunities. A list of the Live Auction items is available here. Tickets are $45 per person, and available online at MyNorthTickets.com or at the TADL Main Library’s Service Desk.